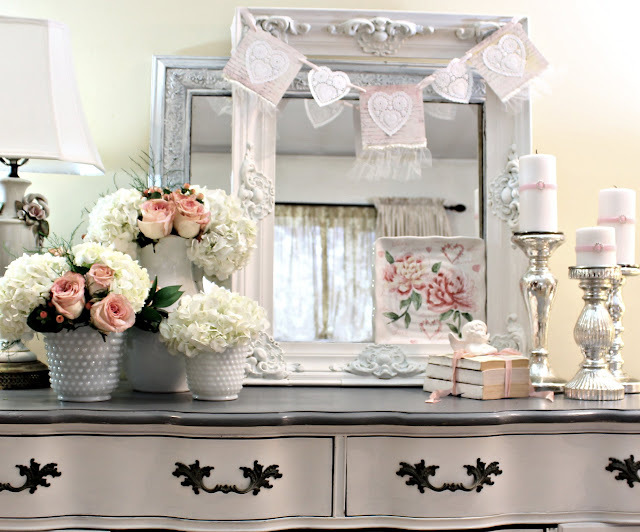 Somethings come over me, I usually don't decorate for Valentines day... but this year I felt the urge to add some sweetness and frills. It must be having the buffet as another surface to play with that motivated me. So here's my sweet Valentines Day vignette. I even sprang a few bucks for REAL flowers! I tied velvet ribbon on the candles and added mini rhinestone buckles for a little bling. I have heart shaped buckles somewhere in my stash... couldn't' find them. I need to get organized in 2012. I made a banner by copying a textured background onto card stock cut them to size and then stamped them with French script. I added the heart shaped doilies to the center and strung hearts in between. I hung it all on vintage pink seam binding. Happy Valentines day! BTW these are my first pictures shooting in full manual. I 'm still working on it, but I shot these on a dark and rainy day. 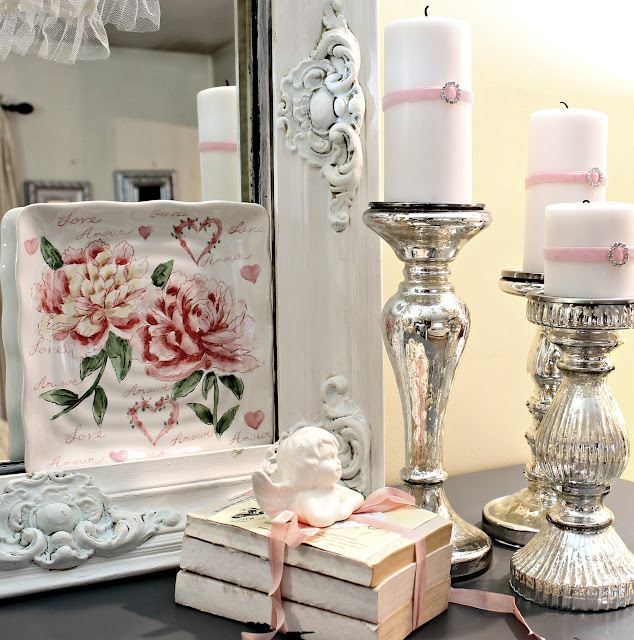 I love your Valentines day vignette! It is the essence of Valentines to me--so sweet and pretty! I love the paper doilies--haven't seen that design before. Breathtakingly beautiful! I just pinned it. This is sooo lovely! I love the cards and the square plate(?) with the flowers. Where did you find such a thing? beautiful!!! Oh Karen, your decorations are gorgeous! I love the way you grouped your things together. So soft and pretty!!! Your Valentines vignette is beautiful! 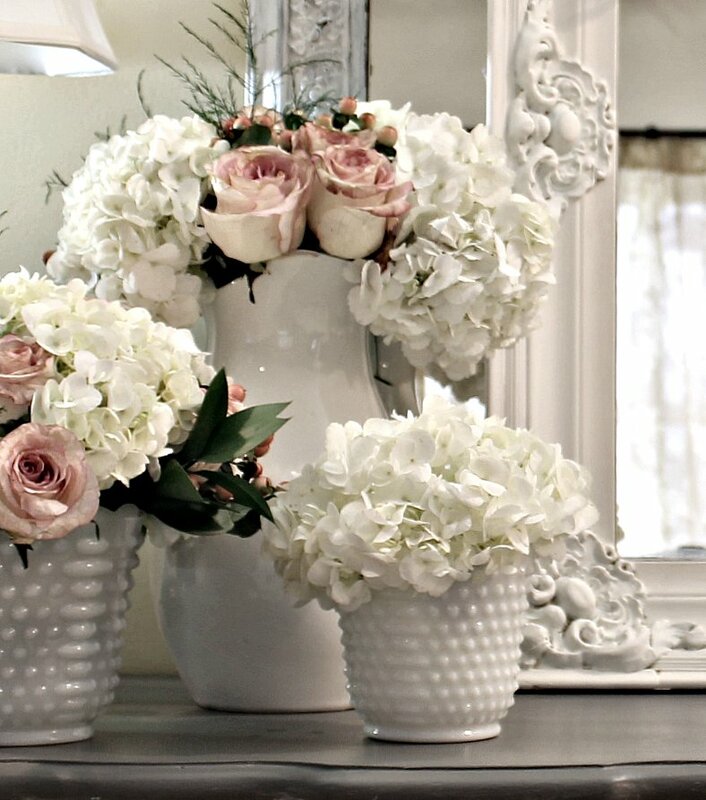 So soft and feminine. I love the plate! My daughter has that plate and I want to steal it every time I'm there. So very beautiful. You are so talented at decorating! So pretty Karen! I love this idea. I had big plans on decorating for Valentines but haven't done a darn thing. Oh Karen, this is stunning! I need to Pin this. It really is a beautiful vignette. I love the mercury glass and the milk glass. Very nice. ooooh this is so lovely. I don't usually decorate either for Valentines day,but you have got me thinking differently. Such a pretty post, I love it all. I thought your buffet turned out so well, it is stunning. Very pretty! 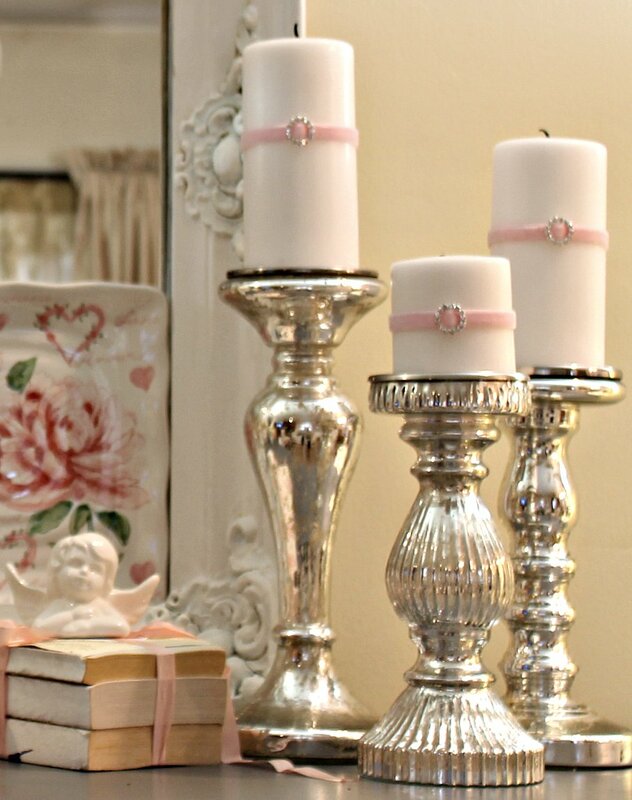 Love, love the velvet ribbon on the candles. Great, fun idea! Wow! Love all the pink too! 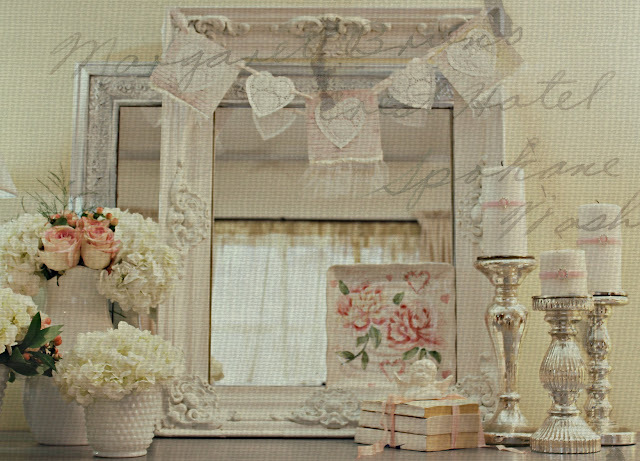 Love the double frame over mirror! Dropping by from Dear Lillie! Hope you will stop by for a visit soon!! 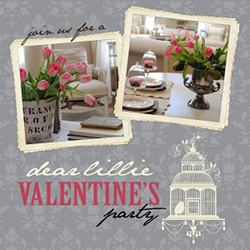 I love the banner - I found your through the Dear Lillie linky party - I will deffinitely be coming back by! I just love the banner, all the different textures. With a touch of pink, perfect. This is just gorgeous Karen!!! How beautiful! This needs to be in a movie...it's so romantic!!! 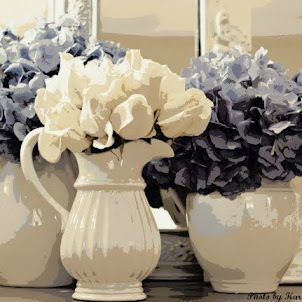 Beautiful vignette! 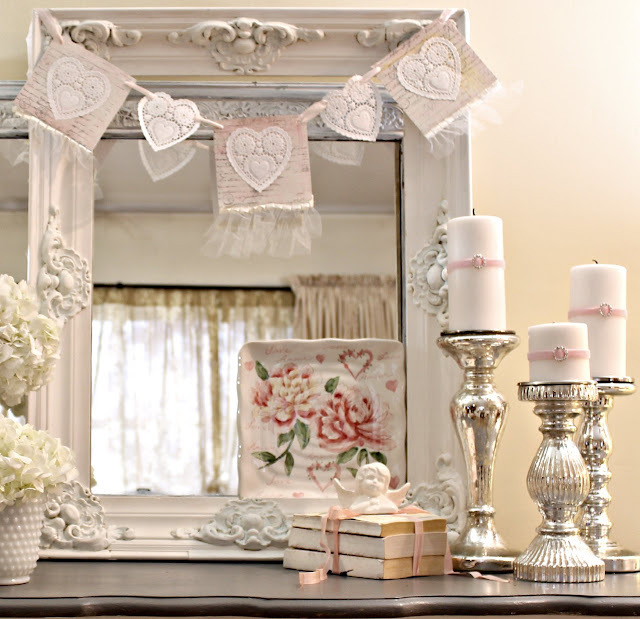 Love the little heart banner and the candlesticks are so pretty too! Just gorgeous! A girl after my own mercury glass and milk glass heart!! Thanks for liking all my crusty vintage finds - following you on GFC & Linky! How lovely is this! I never decorated for Valentine's day either, but this year I felt the need to do it as well. How odd, lol! I am in love with these photos, they are all so bright and cheery, so romantic too! So glad I can follow you now!!! I'm really late finding this posting. :( This is absolutely beautiful! I have a bit of a collection of things for Valentine's Day, but they are not nearly as eye-catching as what you have done!